In order to get quality seedlings, cardamom nursery has to be managed carefully and scientifically. This involves sowing seeds on raised beds, transplanting into primary and then to secondary nursery beds and finally into the field (Cherian, 1979; Kasi and Iyengar, 1961). Seeds should be collected from high yielding vigorous plants, with well-formed compact panicles and well-ripened capsules free from infestation of pest and diseases. Number of flowering branches formed on the panicles, percentage of fruit set and number of seeds per capsule should be given due consideration while selecting the mother plants for seed collection. (Anonymous, 1979; John, 1968; Ponnugangam, 1946; Siddaramaiah, 1967; Subbaiah, 1940). Apart from these desirable attributes, the mother clump should have more number of tillers (shoots) per plant, leaves with dark green colour and high percentage of fruit set. Colour of capsules should be dark green (Krishna, 1968). On an average, 1 kg fruits contain 900-1000 capsules with 10-15 seeds per capsule. Taking into consideration the percentage of germination, mortality due to diseases etc., on an average 1 kg of seed capsules are required to get about 5000 plantable seedlings. Seeds for sowing are collected from fully ripe capsules preferably from second to third round of harvest and are then either washed in water and sown immediately or mixed with wood ash and dried for 2 to 9 days at room temperature. The first method gives better results and is adopted widely. After picking, seed capsules should be immersed in water and gently pressed for separating seeds and washed well in cold water for removing mucilaginous coating of seeds. After draining water, seeds should be mixed with ash and surface dried in shade. Storage of seeds results in loss of viability and delay in germination. In a trial, germination was found to be highest in case of fresh seeds, 59 and 50.6 per cent in vars. Mysore and Malabar respectively (Korikanthimath, 1982). Germination got reduced when there was a delay in sowing after storing the seeds for longer periods especially stored in air-tight containers. Seeds treated with organo-mercurials and stored in open bottles maintained viability up to a period of 4 months. Germination was highest (71.8 per cent) when sown in September (Pattanshetty and Prasad, 1973; Pattanshetty et al, 1978). Korikanthimath (1982) observed that in a clone of var. Malabar there was a gradual decline in germination; 56.7, 51.0, 46.4, 34.1, 32.5 and 29.6 per cent when sown after 60 days in the case of seeds sown on 1st August, 15th August, 30th August, 14th September, 29th September and 14th October, respectively. Cardamom seeds sown immediately after harvest in September germinate uniformly, early and satisfactorily and seedlings are ready for transplanting at the end of 10 months. If they are further retained in nursery beds for the next planting season either by proper thinning or by transplanting at wider spacing in secondary nursery beds, they develop rhizomes with large number of tillers, and are ideal for field planting. (Pattanshetti and Prasad, 1972). The ideal sowing season has been reported to be November-January for Kerala and Tamil Nadu and September-October for Karnataka (Anonymous, 1970, 1979). Cardamom seed possess a hard seed coat that delays its germination. Various studies have been undertaken on the effect of pre-sowing treatments of seeds to overcome this delay in germination. Treatment of freshly extracted seeds with concentrated nitric acid or hydrochloric acid for 5 minutes significantly improved the germination of cardamom seeds sown during November (Pattanshetty et al., 1978; Prasad and Pattanshetty, 1974). Treating with nitric acid (20 per cent), acetic acid (25 per cent) or hydrochloric acid (50 per cent) for 10 minutes was found to be better than other treatments with 97.6 per cent, 98.6 per cent and 91.5 per cent germination respectively. Korikanthimath (1988) found that treatment of seeds with 20 per cent nitirc acid for 10 minutes is the best for enhancing germination in the case of var. Malabar. Apart from other factors, ambient temperature also plays a role in germination. The low winter temperature in the cardamom growing areas reduces germination as well as delays it (Krishnamurthy et al, 1989). 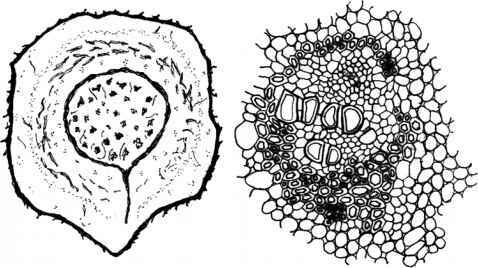 Gurumurthy and Hedge (1987) found that germination is significantly correlated with maximum and minimum temperatures prevalent in the area. It is always advantageous to select nursery site on gentle slope, having an easy access to a perennial source of water. The nursery area should be cleared off all existing vegetation, stumps, roots, stones etc. Raised beds are prepared after cultivating the land to a depth of about 30—45 cm. Usually beds of 1m width and convenient length and raised to a height of about 30 cm are prepared for sowing the seeds. A fine layer of humus-rich forest soil is spread over beds. The beds, when treated with formaldehyde solution (4 per cent) are found to control the damping off disease (Anonymous, 1985). After this treatment beds are covered with polythene sheets for a few days and seeds are to be sown 2 weeks after treatment. Before sowing, beds have to be flushed with water for removing any formaldehyde remaining. The seed rate is 2—5 g per square metre of bed for raising 10 months old seedlings and 10 g for raising 18 months old seedlings (Anonymous, 1976, 1986). Seeds are sown in lines, usually not more than 1 cm deep. Rows are spaced at 15 cm apart and seeds are sown 1—2 cm apart within row. Deep sowing of seeds should be avoided for better and quicker germination. Seedbeds are to be dusted with Lindane at the rate of 60 g/5 m2 to prevent termite attack. After sowing, beds are covered with a thin layer of sand or soil and pressed gently with wooden plank and thin mulch is given. Thereafter, beds are to be watered daily. Germination will commence in about 30 days and may continue for a month or two. The mulch materials are removed soon after the commencement of germination. The young seedlings are to be protected against exposure to sun and rain by providing shade over the seedbeds. Mulching of seedbeds influence germination (Abraham, 1958). Korikanthimath (1980) carried out studies on the effect of different mulches on germination by using locally available mulch materials like paddy straw, paddy husk, dry leaves of rose wood tree, saw dust, wild fern, coffee husk, goose berry (Phyllanthes emblica) leaves, sand, charcoal, polythene sheet and control (no mulching). The beds covered with paddy straw recorded highest germination (40 per cent) when seeds were sown in September and was on par with dry leaves of rose wood (37 per cent), goose berry leaves (37 per cent) and wild fern (38 per cent) (Table 4.2). How to germinate cardomom seed without any acid? How to prepare large cardamom nursery? How to germinate large cardamom?